The Town of Amherst is proclaiming April 8 to April 14 First Responders Week. 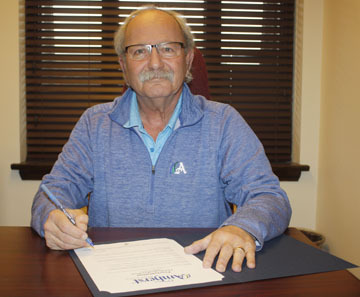 “Council wants to thank the members of the Amherst Police Department, Amherst Fire Department, Cumberland RCMP and the local Emergency Health Services paramedics for the outstanding service they provide the town,” Mayor David Kogon said as he signed the proclamation on April 1. “We owe them our thanks because our First Responders are vital to the safety of our community; they are our first and best defence against emergencies and they often risk their own safety in order to protect our community. The thank you should also be extended to the families of First Responders, Kogon said. The proclamation will be read on April 8 during a flag raising ceremony that will be held at noon at the flags by the YMCA, an event the mayor and council hope many citizens will attend in order to show their support for the First Responders. Kogon also hopes people will come out on April 11 when an open house featuring exhibits from all First Responders will be held at the Amherst Fire Department between 4 p.m. and 7 p.m.
“We encourage parents to bring their kids to the open house and hope people of all ages will come out and see the equipment our First Responders use first-hand and to say thank you to those who serve this community with such dedication and professionalism,” the mayor said. A third opportunity to say thank you will occur on Sunday, April 14, when the mayor and members of council will join the First Responders in a parade to First Baptist Church, where a church service honouring the First Responders will be held at 2 p.m.